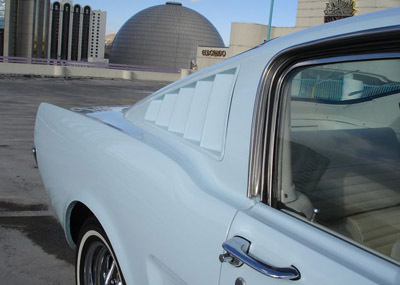 The 1966 Ford Mustang fastback was an instant success, from it's late 1965 model year introduction. The now truly iconic fastback shape, actually made it's debut in much larger Ford cars including the big Ford Galaxie, in an attempt to improve their aerodynamics in NASCAR racing. It is of course, also the body style that Carrol Shelby chose to build his famous Shelby GT350 Mustangs. 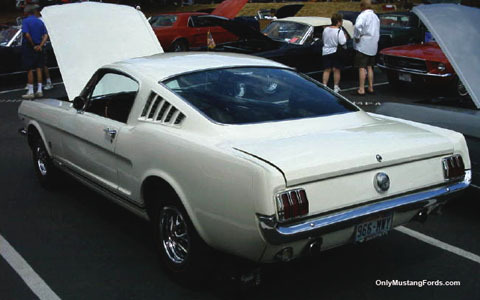 Unlike the 1965 Ford Mustang fastbacks, which were offered late in the '65 model year, the 1966 2+2 Mustangs were offered for the full model production run. Ordering a 1966 Ford Mustang Fastback not only drastically changed the look of the iconic pony car, but it allowed the addition of some pretty cool extras, some of which were optional equipment. As you might expect, since most of the 1965 Mustang model year provided either the coupe or the convertible, there were few changes to the new 1966 Ford Mustang Fastback. And that was fine, just as it was, with it's cool louvered rear panels and an operating vent, where the rear quarter windows would have gone, in the coupe. 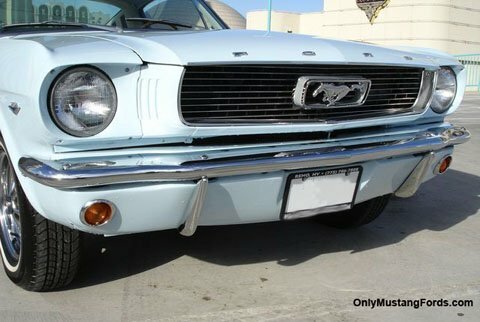 The one, easy way to tell a 1966 fastback at a glance, at least on the non GT package equipped cars, was the new "floating" pony and corral emblem on the new front horizontal striped grill work. 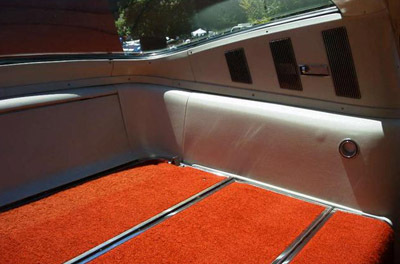 A mixture of familiar 1965 colors and new 1966 Mustang paint codes were offered. Here's a link to the full paint colors for the 1966 Ford Mustang fastback paint codes, names and colors. 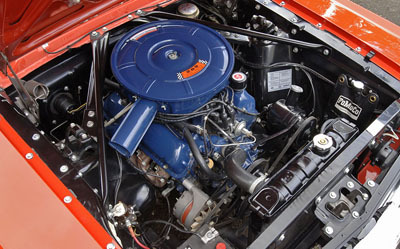 There were a total of three available engine choices. For the fuel economy minded, a 120 horsepower, 200 cubic inch straight six was offered. The two available V8 options were the 200 horsepower 289 V8 with a 2 barrel carburetor, or the new hipo, or high performance 289 V8, with its high compression engine pounding out a very healthy 271 horsepower, beating that famous winning power to weight combination of 10 lbs per horsepower. Mustang's with this particular engine combination, carried the letter K in it's engine designation on the car's serial number stampings, to identify that particular powerplant. That's why cars endowed with the famous performance engine are also known as K Code Mustangs. 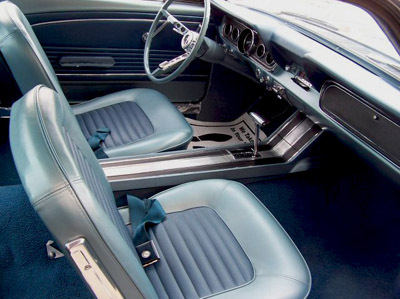 The 1966 fastback, now featured as standard, the new GT style, restyled dash instruments, which featured round faced, easy to read gauges, with a large speedometer sitting front and center and included oil pressure, ammeter, water temperature and fuel gauges. Other additions for the model year, were reflective of new tougher US government safety standards which mandated that all new cars be equipped with emergency flashers, standard electric wipers with windshield washer pump and a padded dashboard. A total of 35,698 fastback Mustangs were produced for the 1966 model year, making the 2+2 much more rare than the 1965 models, which totaled just over 77,000 units. Classic Mustang enthusiasts still seek out these fastback cars, meaning that there are few cheap 1966 fastback Mustangs for restoration and guarantee a nice high price when restored. And If you are lucky enough to find a K Code pony car with a "numbers matching" engine and drivetrain, you are really in the money. Other Options for Mechanically Inclined Enthusiasts. If you can't find, or afford the car of your dreams, or find a good fastback project car, there are some viable alternatives. The lack of availability of good rebuildable cars has created, not only the fairly recent introduction of complete Ford Motor Company licensed fastback bodies for the 1965 and 1966 cars, for about $15,000. Another alternative comes from companies in the US that will take basic 6 cylinder coupes, which are plentiful and still relatively cheap and using reproduction panels, convert them to their more expensive cousins for about half the price.